Running into potholes left and right? This is the chief contributor to the misalignment of your wheels. Misaligned wheels can diminish the life of your tires by causing rapid and uneven treadwear. Properly aligned wheels improve driver safety, enhance your driving control, increase fuel efficiency and maximize the life of your tires. Save your tires before it’s too late. When your tire alignment is off, your ability to drive safely is compromised. Sometimes unaligned wheels can be obvious – your car pulls to one side of the road or your steering wheel has a vibration in it from balancing issues. In some cases, it can be subtle and the driver won’t even notice. That’s why regular tire alignment checkups are a must-do. The better maintenance you keep, the longer your car will run healthily. If your car alignment feels off – or if it’s simply been a while – come see us at CARMAX AUTOCARE and our alignment experts will take a look. When your wheels are aligned, your car handles better. Wheel alignment from CARMAX AUTOCARE means long lasting, optimal performance. Our technicians know how to keep your car running straight and smooth. When a vehicle’s suspension, steering and drive-line components begin to wear, it can cause vibration, misalignment and premature tire wear. That’s why the expert auto technicians at CARMAX AUTOCARE perform a suspension system and steering inspection with each car alignment. When you have worn parts replaced, you’re able to regain handling and steering control. Your car will run like its old self, returning to its original handling and operating performance. Wheel alignment is a critical aspect of car maintenance, as misalignment damages your tires and can lead to them wearing out prematurely. 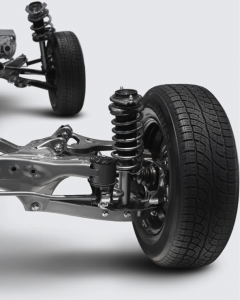 CARMAX AUTOCARE technicians can make sure your steering and suspension are working as they should be and align your car to match the manufacturer’s specifications.